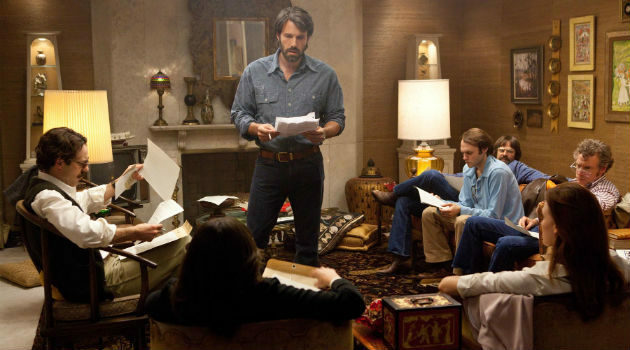 Former President Jimmy Carter gives Ben Affleck's talked-about new movie Argo a shot of credibility in this behind-the-scenes clip from the movie. The former Commander in Chief, whose presidency was hobbled by the Iranian hostage crisis — during which 52 Americans were held for 444 days from Nov. 4, 1979 to Jan. 20, 1981 — acknowledges that, as told in Argo, there were six diplomats who managed to evade capture and were spirited out of the country as the crew of a fake Canadian science-fiction movie. Check out Movieline's photo gallery from the Argo premiere featuring Ben Affleck, George Clooney and Stacy Keibler here. Adding to the truth-is-stranger-than-fiction quotient of the movie is the character of Academy Award-winning make-up artist John Chambers (John Goodman), who, in addition to working on the Planet of the Apes movies and inventing Spock's pointy ears for Star Trek, was a CIA agent. Chambers, working with his agency colleague Tony Mendez (Affleck) played a key role in the story. In the clip, Breaking Bad actor Bryan Cranston, who plays CIA officer Jack O'Donnell, says that although Argo, which opens Friday, is steeped in espionage and bureaucracy at the highest level, truly, when you get down to it, it's about the human experience and what lengths people will go to save the lives of others." Argo is in theaters Friday. Read more here.